Bone disease affects 10 Million people and causes 1.5 Million fractures a year. More specifically, 50% of women and 25% of men over the age of 50 will have an osteoporosis related fracture in their lifetime. BoutonStrong is a non-pharmaceutical approach, safe, effective and regulated way to increase the density of bone mass and muscle tissue density through compression of the bone with high loads of impact for people of all ages and fitness levels. In less than 15 minutes per week through 4 precise exercises, BoutonStrong targets and stimulates all the major muscle groups and safely delivers the custom intensity required to stimulate your body to naturally increase bone and muscle tissue density. This revolutionary technology is the future for fracture and injury prevention, anti-aging, increased athletic performance and natural pain relief. Clients have not only reversed osteoporosis but also have experienced relief from back and knee pain, arthritis and sports injuries. In 2012, a study was published that showed the subjects had to experience at least 4.2 times their body weight in order to trigger the growth of healthy new bone tissue. With BoutonStrong and its unique osteogenic loading method, members easily experience 4 to 10 times their own bodyweight without injury or pain thus triggering the development of healthy new bone tissue. 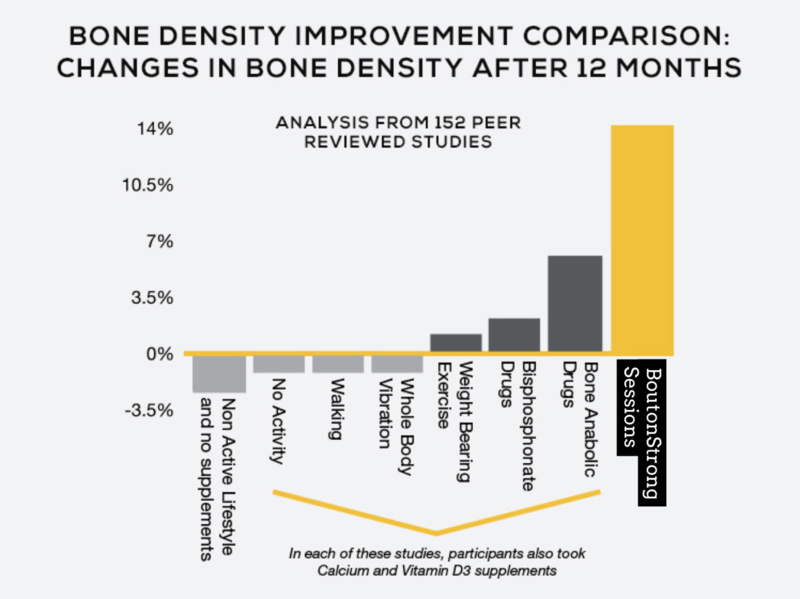 A user volunteered and unsolicited study of patient DEXA scans shows an average bone mass gain of 4.5% in 3 years. (Please reference comparison chart on the next page) BoutonStrong IS THE exclusive and elite bone health and fracture prevention program that will also greatly improve quality of life, mobility, posture, balance, reflexes and breathing while giving a feeling of greater energy and reducing pain. In less than 15 minutes per week, this revolutionary technology is the future for fracture and injury prevention, anti-aging, increased athletic performance and natural pain relief. Clients have not only reversed osteoporosis but also have experienced relief from back and knee pain, arthritis and sports injuries. It works for people of all ages and fitness levels. We would be happy to discuss with you any thoughts or questions you may have, send you additional information regarding the BioDensity machine we use, or host you in our clinic for a firsthand experience yourself with BoutonStrong.